Please join Bryn Jones, head of fixed income and fund manager of the Rathbone Ethical Bond Fund and Rathbone Strategic Bond Fund on Thursday 27 October at 11am for our live webcast. Bryn will give an update on recent performance and how the funds have been positioned for the recent rise in yields. 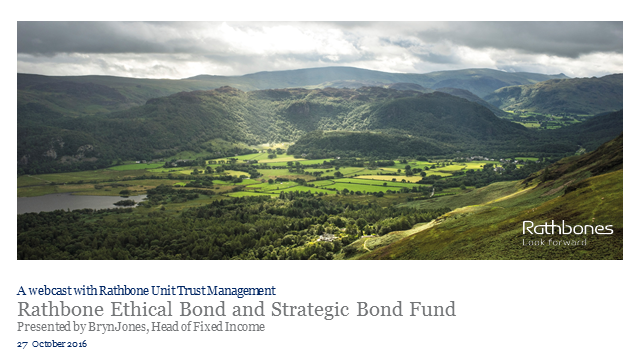 In the Rathbone Ethical Bond Fund, Bryn has been overweight UK subordinated financial names; looking for higher yielding bonds from companies with strong balance sheets, to limit negative impacts from higher US interest rates (that pushes up the baseline for worldwide bond yields). In the Rathbone Strategic Bond Fund, Bryn will highlight how the fund has benefited from low duration, emerging markets and overseas currency exposures. Put your questions to Bryn in advance or during the call using the ‘questions’ tab at the top of the video screen. A recording will be available 'on demand' after the call if you unable to join us at 11am.